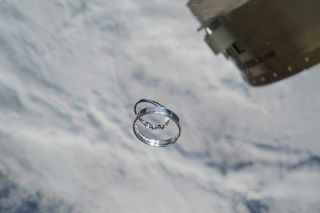 Astronaut Thomas Pesquet brought these wedding rings along for his six-month stay at the International Space Station. Talk about a best man! French astronaut Thomas Pesquet brought along some very special cargo for his six-month stay at the International Space Station: a shiny, silver pair of wedding rings. "In my 1.5 kg 'hand luggage', I brought the wedding rings of my friends getting married this summer!" Pesquet wrote on Twitter and Flickr. "I'll be back in time to be their witness." From the engraving inside the larger ring, it looks like his friends will tie the knot on Aug. 14. With Pesquet's return to Earth slated for June, that leaves the astronaut plenty of wiggle room to get the rings back to their rightful owners in time for the big day. "Wedding rings from space, now that's a grand romantic gesture," Pesquet wrote in a subsequent Twitter post, where he attached the song "Magnificent Romeo" by Basement Jaxx. Pesquet, a flight engineer and first-time space flyer, arrived at the International Space Station in November, along with NASA astronaut Peggy Whitson and Russian cosmonaut Oleg Novitskiy. Though Pesquet isn't married, he does have a girlfriend who works at the United Nations in Rome, France 24 reports. After caring for his friends' wedding rings in space for six months, we bet he's planning a toast that is truly out of this world!